The Canucks went into Boston and took another two points on the road with them on Thursday night, continuing what’s ultimately been a largely successful trip through the Eastern Conference results-wise. Despite having been routinely outshot along the way, they’ve now gained at least a point in 7 of their past 8 games, allowing them to keep pace with the rest of the non-LA Kings Pacific Division teams. While this particular performance was actually a step-up from their previous showings during that stretch, the win itself seemed immaterial in the grand scheme of things. Taking much of the shine justifiably was Daniel Sedin, who leapfrogged Markus Naslund for sole claim to the franchise’s goal scoring throne. It goes without saying that in lighting the lamp 373 times to-date (including the playoffs), there have certainly been some notable ones mixed in there that won’t soon be forgotten. Of the bunch, maybe most memorable was the hat trick goal in the final game of the 2009-2010 regular season that helped sew up the Art Ross for his brother in typically remarkable Sedin fashion. The skill involved in completing the sequence was one thing, but it was the trademark telepathic communication the two of them share that the made it all possible. It’s that timing, positioning, and hockey sense that’s allowed them to continue having leverage over opposing defenders even as their physical abilities have began to progressively deteriorate over time. While each of them possess their own unique skills that surely would’ve played in any environment really, it seems fair to posit that the combination of the two of them was greater than the sum of their individual parts. With that in mind, the dichotomy of the scene’s backdrop immediately following the goal itself was jarring. There was Daniel Sedin, celebrating an exemplary career milestone in a place that’s represented a personal haunted house no less, with the person he’s shared such an extraordinarily large number of the stepping stones culminating in that moment nowhere to be found. Instead it was Jared McCann, currently serving as the team’s number one center while Henrik licks his wounds, who was the first to embrace him for an accomplishment that’s been 15 years in the making. There was something incongruous about it. Though given the type of season they’re having as a team I’m sure they’ll take an occasion worthy of genuine elation like this one in any form they can get it. From the outside, it’s hard not to view all of it as somewhat bittersweet now that we’ve had a few hours to process it. Much like they have since the moment they took the mantle from those that carried it before them the Sedins are doing an admirable job of fighting. Fighting not only on the scoreboard, but also in the way they’re publicly perceived around the league. When we look back at their careers, what they’re currently doing in their age-35 season by dragging this particular supporting cast kicking and scream towards anything resembling relevance is near the top of their greatest accomplishments. They don’t quite have their fastball every night like they used to, but they’ve come as close to it as anyone could reasonably expect from them at this point in the game. Daniel, in particular, has been a revelation this season by bucking his recent downward spiral as a scorer. With his 21 goals this year he has already shattered his totals from the previous three seasons. The issue is that regardless of their best efforts, they’re still ultimately toiling away on a team that’s far closer to being at the bottom of the league than the top as currently constructed. That’s something that’s hard to reconcile for a couple of generational talents, spending what could very well be their final truly productive seasons as part of an organization that doesn’t appear to be going anywhere anytime soon. It’s been a joy continuing to watch them play on a nightly basis, but given everything they’ve been and done for the Canucks, you can’t help but feel like they deserve a better fate than this. There’s an overwhelmingly negative tone to this article. Why? So unnecessary. They’re a team in transition. Enjoy the process. Exactly. Just like those who say the teams owes the twins a chance to win, so we can’t rebuild fully. This franchise provided them an opportunity to win the cup, something other top talents have not always had (Marcel Dionne comes to mind). They damn near did, they were certainly on the ice in game 7 playing for a team that was also the best in the regular season that year. Add to that the ice time they were provided in their early years to let them become the players they are, and they’ve had their due. Finally, they have always been nothing but first class people, and the way they have represented this team and province is commendable. I think they understand the process, and will continue to be true Canucks for as long as they can compete at a high enough level to enjoy the game. Then we’ll hang their jerseys in the rafters and tell the youngsters about these amazing twin superstars who we were lucky enough to have dazzle us night after night. If i could prop this 10 times I would. Really well said. There’s also little to show that they themselves feel the level of frustration with their ‘window closing’ as many others seem to feel. They are highly accomplished athletes who are exceedingly well compensated and are able to live in a community they clearly enjoy with their families. That says nothing about their competitiveness (or as some people seem to think lack thereof if they’re not urging a trade to another team that’s more of a contender) but likely speaks more to their ability to make a good transition to a post-playing career (a la a Naslund, Linden, Yzerman, Sakic, etc). I’ve always wondered about the roots of the hatred that a certain kind of person has for the Canucks. I don’t think it’s nearly as widespread as sometimes claimed. I think the Sedins are rightly respected by most — it’s the troglodytes like Thornton and fans of idiots like him who trot out the old tired insults against a couple of players who are not only two of the most skilled I’ve ever seen but also two of the toughest. Congratulations to Daniel and Henrik for not only leading our team through the best decade I’ve seen the Canucks play but for leading them through the transition to the next generation. I don’t think Dimitri was being overly negative, just realistic. And a bit nostalgic. The Twins are the best thing to happen to this franchise ever. The sum of their contributions trumps Bure, Linden, The West Coast Express years and even Harold Druken. They will contribute to the transition years ahead, but it is sad to think that the team’s next deep playoff run may well be Sedin-less. A team in transition being very poorly managed and coached. The problem with an accidental/stealth tank is that it’s not intentional – it’s a result of poor decisions. And those poor decisions hurt us in the short and long term. They set back the rebuild AND prevent us from being competitive in the meantime. Drafting Nylander or Ehlers over Virtanen would’ve helped us now and in the future. Not tying up a ton of cap space and ice time in Dorsett, Prust and Sbisa hurts us now and for the length off their contracts. The young players look to the Sedins for guidance. They don’t need to learn lessons from grinders. We want our top prospects learning from the most talented and professional stars this franchise has seen. Not recognising you’re a bad team and holding onto expiring assets for near certain failure in a very short playoff run hurts us now and in the future. Giving ice time at key moments of the game to your 4th line ahead of your 2nd and 3rd (including your developing prospects) hurts the team now and in the future. This is not an enjoyable process. Which is worst? Not recognizing its a bad team, or recognizing that the team will go nowhere in the playoffs and still retaining expiring assets to make the playoffs for the sole purpose of playoff revenues. Sorry. This ownership group lost me as a paying fan when they opted for the latter, going contrary to their stated objective of bringing a Stanley Cup to this city. Drafting Nylander or Ehlers over Virtanen would’ve helped us now and in the future. There’s nothing easier than criticizing draft picks well after the fact. It’s a rare pick, after all, that in hindsight chooses the very best player available. But we’re going to have to wait five years to really know how sound the Virtanen pick was compared to the alternatives. So far, at least, he’s looking just fine. Not sure what your idea of competitive is, but standings currently have Canucks in playoff spot, Winnipeg with Ehlers, is last in division, Nylander not even in the show yet. Not saying Ehlers & Nylander won’t be good players, Virtanen, like the other 2 may be just as good. Each of these players provide different aspects to the game. The NHL season is long look at some of the teams that flew out the gate & have since struggled. Learn patience, enjoy the development of our young players. I am sure Chicago fans thought the same before they became what they are today. Would love to see your definition of a successful team in transition. WPG and TOR are currently 26 and 28 in a league that admittedly has much more parity than before. But they continue to languish — though I think TOR in particular has a much better plan in place. EDM despite all its high picks is in 27th. These are moreover teams that have mostly missed the playoffs for a decade. So you see the Canucks team, one that has had a decade of pretty solid to stellar regular season and occasional playoff success as being poorly managed as it moves through the retirement of its two elite players? For me I see that in two years the Canucks have moved from a team that was probably dead last in prospects to being middle of the pack. That’s no small feat. I see this year that we’ve debuted nearly a dozen players with young players like Horvat, Baertschi, Hutton, Markstrom, Vey, McCann all getting valuable experience and progressively more ice time. We’ve moved out vets on the decline. The management group has NOT shown an unwillingness to acknowledge moves that weren’t working — sending down Vey earlier or benching Prust or demoting Higgins. And despite all the hate for WD, he has slowly increased responsibility for young players and seen corresponding success. I honestly don’t know what people want. For us to ice an all-AHL lineup so we lose every game? To play the vets into the ground in the off-chance we win? What do people think a teaching coach is supposed to actually do? Throw your young players to the wolves and let them sink a la Edmonton? Or try and shelter them so that you can eventually build their confidence? At the end of the day I think we can all nit-pick all kinds of moves. There’s ones I don’t agree with. But the question has to be what, overall, is the outcome? Two years on are the Canucks better than the were at the end of the Gillis regime? Are they trending in the right direction? For me its clearly yes. I’m on the fence about missing the playoffs — I’d like a top pick but I also think the experience could be invaluable for these young players. That would be my number one priority, not whether or not the Canucks are winning today or next season or the one after that but what they look like when Horvat and co are in their prime. Excellent road game for the Canucks! Not sure why every article around here has to paint such a dire picture. Except that’s not true. The Canucks are holding onto a playoff spot right now, which puts them in the upper half of the league. If the Leafs or Oilers were holding onto a playoff spot at this point in the season, they would be parading around in the streets, but here we are whining about days gone by. I don’t know what team the writers around here are watching, but the team I am watching is winning a decent number of games, getting screwed in pond-hockey-overtime, but still doing reasonably well overall. They are being led by a few youngsters in Horvat and Baertschi, and have McCann, Hutton and Virtanen learning the ropes, with Gaunce and Shinkaruk waiting in the wings. Add to that, the Sedins are still elite. This is despite the fact that writers around here have insisted for the past two or three years that they are showing age-related declines. The style they play, it is entirely possible they remain elite until they are 40, which would mean their window hasn’t closed. Am I optimistic? Sure, but it’s a heck of a lot more fun than wallowing in negativity. Let’s not omit the sweetest part of the goal, that one of Daniel’s personal tormentors, a certain ostrich-like defenseman wearing #33, had a front row seat for it. I also want to echo the sentiment of a number of my fellow commenters that the negative tone of this article seems somewhat unwarranted. Over the last couple of weeks this team has actually filled me with more optimism than it has all year, as it seems that Markstrom is on his way to being a solid NHL starter, and that as soon as next year, we could see as many 8 forwards on the team who are under the age of 24 and none of them looking out of place (Horvat, Baertschi, Virtanen, Etem, McCann, Vey, Shinkaruk and Gaunce). 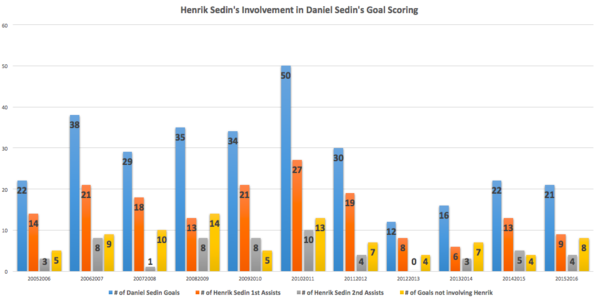 The team seems poised to hang onto the right vets too: Sedins, Hansen, Sutter and Dorsett. I have strong reservations about the shape of the d-corps, and hope it doesn’t become this management’s Achilles heel, but this Benning naysayer has to admit that on 2 out of 3 counts, he’s not been too bad up to now. Why add the negative spin. Daniel hit a milestone as the greatest scorer in Canucks history. Congrats. The team is 6-2-2 in their last ten games despite injuries to our top players. The kids are playing good, we are getting great goaltending, our injured players are soon to return and we are winning despite these injuries. What’s not to like. Overall the article was fine in terms of tone. For a nostalgic retrospective a certain bittersweet tone is expected. I’m not sure that the time has come quite yet to eulogize the Sedins but hey, editorial choices. The backhanded swipes at the Canucks team/organization in the last paragraph seem wrongfooted. There should have been a better way to say, “The Sedins are great people and great players, it’s too bad they won’t get their names on a Stanley Cup” without having to get your shots in. It’s a bit of a snipe, but I consider it a little rose coloured to ignore the ownership/management’s role in the past few years of stagnation in the team’s growth progress. Can you imagine how we could’ve looked if we sold off assets and started the youth movement during the Torts year? I can’t help thinking that as the youth movement continues to roll over the next year or two, if management can convert Vrbata/Miller/Burrows money into a couple of bonafide top-4 defensemen (because they don’t exist in our prospect pool), then this team is conceivably a legitimate contender before the Sedins depart from Middle Earth. When healthy (and let’s not lose sight of just how snakebitten the team has been on that front this year), the Canucks sport one of the better four centres in the league (especially if you give McCann another year). Horvat, Baertschi, Etem, Virtanen, Shinkaruk et al. sport an appealing range of size, speed, and skill that will demand more attention and use. I’m not saying it happens overnight—and a number of pieces need to fall just so—but I see a lot of promise. To everyone complaining about the article’s negative tone: have you been watching the games recently? The kids are playing well but the team has been getting outchanced/outshot by a 2:1 margin in almost every game. Our goaltenders have bailed us out big time, we very easily could’ve been 2-6-2 instead of 6-2-2 in our last 10. There’s a time for optimism, and that time isn’t when your goalies are putting up ludicrous save percentages to bail the team out. If this team can turn it around once Sutter and Henrik come back, then we can start dreaming. Until then, let’s keep it real.